The first thing you need to know about California abalone is how to pronounce it. It kind of rhymes with macaroni: ab-ah-LOW-nee. Or maybe it sounds a little like someone saying: "Ab- baloney." Now that you can say it, why should you care? What's the big deal and why should you eat abalone when you're in California? Abalone is technically a mollusk, but this fact alone might not very helpful. You may not know what a mollusk is and even if you do, there are 85,000 kinds of them. An abalone is like a clam or a mussel, but they only have one shell, not two. And they're larger. The red abalone is the largest and the most prized variety, and the only place they live is on the west coast of North America, especially in California. They cling to rocks, and when a piece of kelp drifts by, the hungry mollusk clamps down on the kelp with its foot and then munches away. But all that technical stuff aside, just think of abalone as California's answer to New England lobster - but rarer and some say even more delicious. Inside an abalone's beautiful, red-tinted iridescent shell, is clam-like meat. When prepared and cooked well, the meat has a delicate flavor and is easy to cut with the side of a fork. Commercial abalone fishing is illegal in California, so the only way to get it is to dive for it, get it from an abalone farm, or order it at a restaurant. If you have a seafood allergy, you should avoid eating abalone, according to the Cleveland Clinic. You may find abalone for sale in grocery stores, at Costco or other places, but much of it is imported. To be sure you're getting the prized, local California red abalone, ask the store or your restaurant server about their source. To prepare a live abalone for cooking, you have to get it out of its shell. Most people remove the digestive system around the edge by scrubbing it off. At The Abalone Farm in Cayucos, they leave that gray fringe on to create a "rustic" style version. Abalone appears on the menu of many coastal restaurants but may not be offered year round. A good place to start looking for it is to check the list of customers from the Abalone Farm near Cayucos. Among them is the Pacific Cafe in San Francisco, a neighborhood restaurant that serves fresh seafood, simply prepared. Ember Restaurant in Arroyo Grande (near Pismo Beach) serves dishes using rustic abalone from The Abalone Farm. The World Championship Abalone Cook-Off is held in Fort Bragg (Mendocino County) in October. It's open to the public free of charge, but if you want to sample and judge the dishes, you have to buy a tasting ticket. 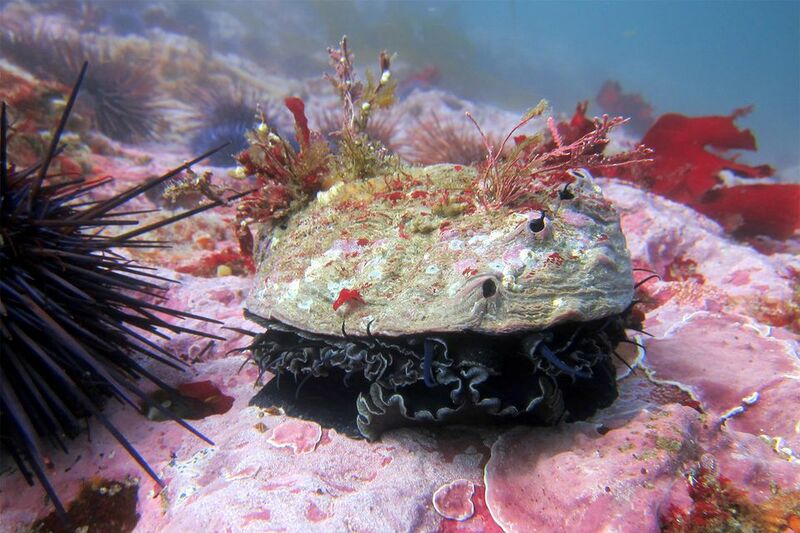 We know of four abalone farms that operate along the California coast. You can buy live abalone in the shell or buy prepared abalone steaks that are tenderized and ready to cook. The edible portion of an abalone in the shell is about 40% to 45% of its weight. One pound of abalone steaks yields enough meat for about four to six people. The Abalone Farm in Cayucos only sells commercially, but you can buy their product from Giovanni's Fish Market. Monterey Abalone Company ships live to anywhere in the US overnight. You can also buy online or get abalone direct from American Abalone Farms in Davenport, north of Santa Cruz. The Cultured Abalone Farm in Santa Barbara takes phone orders and sells at the weekly Fisherman's Market. West Coast abalone are a well-protected creature, but if you know the rules - and can free dive to collect them, you can harvest your own. To do that in California, you need a fishing license and an abalone report card. You can get those at some sporting-goods shops, hardware stores, and pharmacies - or online. In general, abalone hunting season starts in April and ends in November, but it's more complicated than that simple statement. You can't hunt for them in July. In some areas, the season starts instead of April. The hard part of it all is that you can't use scuba gear or surface-supplied air when you're diving for abalone. Instead, you have to free-dive in the kelp beds and pry the abalone off the rocks. And make sure they're large enough (7 inches across or more). It's a dangerous activity and people die trying it every year. If you don't have the gear or want some help learning how to dive for abalone, Sonoma Coast Divers offers abalone-diving classes, equipment rentals and picnics in Salt Point State Park. This recipe comes from chef Eric Olson at Allegretto Vineyard Resort in Paso Robles. This is an insider dish. In the 1920s, a Monterey chef named "Pop" Ernest Doelter invented the abalone steak, tenderizing the abalone meat and frying it in butter. His simple preparation is still one of the best, a method that shows off the abalone's subtle flavor without overwhelming it. Kinch recommended tossing the abalone in flour. Chef Neil Smith of Windows on the Water in Morro Bay goes a step further. He coats the abalone in flour, then dips it in egg wash, followed by Panko bread crumbs and another coating of flour. At Sea Venture Beach Restaurant in Pismo Beach, the chef uses crushed saltine crackers as a coating, dipping each piece in egg and crushed saltines twice for a thicker coating. In a small bowl shallow and wide enough to hold one abalone steak at a time, beat the egg with a fork until slightly foamy. Place breadcrumbs in a second bowl. Dip the abalone steaks in egg, then roll in bread crumbs to cover. Do not salt. Heat the butter in a sauté pan over medium-high heat. When the butter stops sizzling and begins to foam, add the abalone to the pan. Gently shake the pan constantly. When the butter turns hazelnut brown with a nutty aroma (about 2 minutes), turn the abalone over and sauté another minute. Remove the cooked abalone to a plate. Add the lemon juice to the pan and shake it to mix with the juices. Spoon some of the lemon juice over each serving. Top with a pinch of fleur de sel or sea salt. Classic western style abalone is the base for lots of variations. The ones below are a few of them. At Sea Venture Beach Restaurant in Morro Bay, the chef serves the abalone on toast triangles and tops it with oyster mushrooms sautéed in olive oil and quail egg cooked sunny side up. He surrounds that with garlic cream sauce and garnishes it with a few thinly sliced green onions. Roll mint leaves into a straw-like shape and cut as fine as possible. Set aside. In a small sauce pot, mix the peppers, vinegar, sugar, mint, and cilantro. In a metal bowl, whisk together the cornstarch and water. Turn down heat and, while stirring with a whisk, pour in the cornstarch and water mixture. Serve hot or cold. Refrigerate if not served within 4 hours. Executive chef Neil Smith at Windows on the Water in Morro Bay fries the abalone in a mixture of oil and butter then tops it with uni butter and serves it over an Asian salad. In a mixing bowl, whisk together the uni, lemon juice, and cream. Pour into small sauté pan and turn on the heat. After it boils, turn the heat down to simmer and add the butter one cube at a time, constantly stirring by shaking the pan in a clockwise rotation. Once all butter has melted and blended together, add a pinch of salt. Keep warm and set aside. Serve the abalone over a salad of Asian microgreens, Wakame seaweed salad, julienned cucumbers and sesame seeds, dressed with Lemongrass Vin made of chopped lemongrass, rice vinegar, honey, chopped basil leaves, lemon juice, and canola/olive oil blend.